With summer just around the corner thoughts of the beach are high on everyone's list. I'm not quite sure why, but my son LOVES jellyfish right now. I just saw two very cute jellyfish that I thought I would pass on. 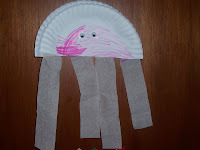 The first jellyfish my son made in his class. They used one large paper plate cut in half, white crepe paper strips, markers, glue, and wiggle eyes. The teacher cut the plate in half. Then the children glued the crepe paper strips to one half of the plate(from the cut edge), then they glued the second half of the plate on top of the first. The children decorated the jellyfish with markers and then added wiggle eyes. The second jellyfish was very colorful. You would need a coffee filter, markers, water sprayer, small styrofoam dessert cup, glue, and strips of waxed paper. I saw these jellyfish hanging from the ceiling of our local kindergarten teacher's class. They really looked great. The children colored the filters with marker then sprayed them with water so the colors ran together. After the filter dried it was glued to the bottom of the dessert cup--so that the filter hung over the cup--finally the strips of waxed paper were crinkled up and glued to the inside of the upside down dish and hung down like tentacles. I don't have a picture of this one so I hope you can envision the finished project from the instructions. They were really adorable. Have fun! Great ideas for preschoolers. My daughter loves creating crafts at school and sharing them with us. Great start to a wonderful blog!